Is the Pentel Aquash water brush pen worth it? I've seen a lot of artists use this water brush that you can refill and I was wondering if it really is worth it. I am still a novice when it comes to watercolours and I use normal watercolour brushes. What are the pros of using the Aquash water brush pen? I am also a novice with watercolor. The brush pens are pleasant to work with, especially if you have more control over your application with pens over traditional watercolor brushes. You can determine how much water should be used with pressure, and also use pressure to quickly clean pigment off the brush tip. I personally use the Ohuhu water brush pens, myself, but even then some traditional brushes will be needed. 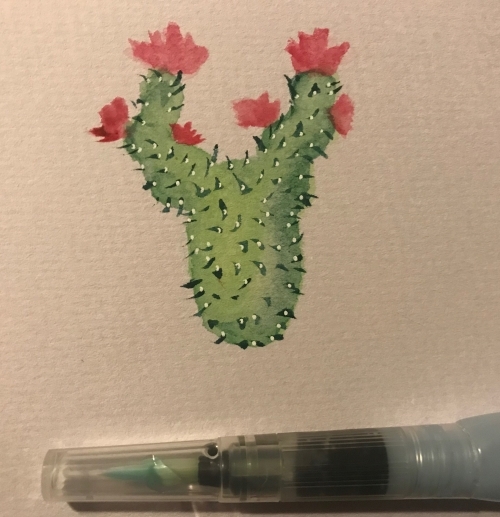 For example, I did a quick cactus with only one brush pen. This particular brush did not have a fine enough tip to properly do the needles as I would have liked. So, as a beginner you will likely want to mix and match brush pens and traditional brushes. Brush pens can be fairly cheap, and the ones that come with an end cap are quite nice for traveling with! Not the answer you're looking for? Browse other questions tagged watercoloring paint-brushes or ask your own question. How can I prevent watercolor paper from buckling? What are the different type of paint brush bristles? How can I clean a paintbrush used in acrylic paint? How can I make a sketch under a watercolour painting and have it not be seen? Should I consider watercolor wash outlines mistakes? What are the different type of artist brush configurations and their purposes?